The Geek Chic iPad Case is a sewing project from Lisa Lam's book A Bag for All Reasons. You might know Lisa from her site U-handbag.com. 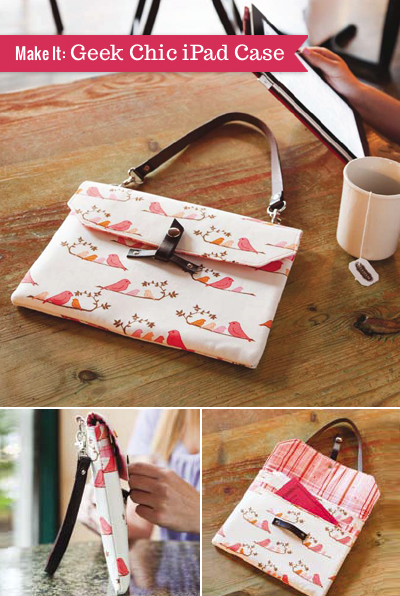 Since I have a bag addiction, this book with 12 different sewing patterns makes me super happy. They're modern, clean, and make smart use of hardware. I've seen tons of bag and purse patterns that combine appliques, ruffles, and patchwork in a crazy mess. Cool if you like that sort of thing, but I prefer simplicity. Let the fabric be the star, I say! So I'm a fan of Lisa's lovely patterns. 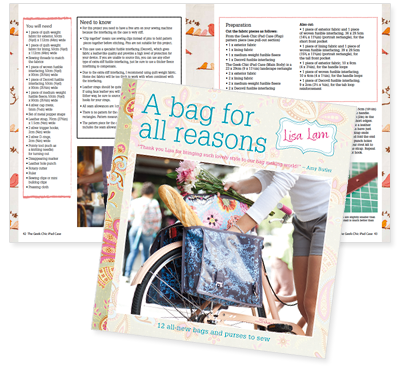 Want to try out a free project from her book, compliments of the publisher? I just happen to have that book on my kitchen table! Too bad it belongs to the library. But I do have a bag picked out and plans to make it soon! Thanks, Mum! Goodbye, vacation me. Hello real me. Petra, I love your felt case! Wow, well done! Can't wait to make these for gifts! Pinned to my pinterest under Sewing Inspiration. Thank you! I can't download, anyone else have a problem? would love to try this!! Thank you so much for this post. I want to let you know that I posted a link to your blog in CBH Digital Scrapbooking Freebies (please, notice the new url for my blog), under the Page 4 post on Jun. 05, 2012. Thanks again. Sondray, if it's still not working for you, email me and I'll send you the PDF. ooo, I've been thinking about getting this book. So happy to try out a sample project. Thanks!! and I loved your orange posts! I love this case and will be sure to check out the book thanks for sharing! how cute, the fabric is also beautiful ! Okay, so I am getting married and I am pretty thrilled to be blabbing it all over the world. Having said that, now that I see the ipad case, I am thinking of all kinds of hand-made party favour ideas. AH! I love an iPad case that looks like a purse! SO cute :) You rock!! Got to try it even if I do not own an iPad, it would totally be cool as a bag, too. I just got the book last week and I'm loving it! The pattern is exactly the same as my kids' pottery bard bedsheets bought a couple years ago. I just picked up that book last week - can't wait to get started. I am going to start with the ipad case in this post first - and since I don't have an ipad, I'll be making it for my Kindle Fire and Nook - You can never have enough carrying cases can you?? Awesome tutorial- thanks so much! I love this! May I feature it on www.sewcanshe.com? Please drop me a line and let me know. I cant download either! Would you mind sending me a pdf to my email? nicole24_07@hotmail.com! Thank you so much! This is very cute! Just emailed them to you! Hmm, the links are still working for me... it's possible you need to wait a little longer for the download; it's 1.1 MB so depending on your internet connection, it might take a minute? Otherwise, send me your email address and I can mail you the PDF. I've been making this bag over the weekend and i love it! Going to have to undo it all tonight but on the plus side at least it wasnt too small..
Oh no! I haven't made this, so thanks for letting me know. Can you confirm the PDF was printed at 100% size (no "fit to page" option checked or anything?) Let me know and then I'll contact Lisa or the publisher to get a corrected file. I 'think'I did both and they came out the same size, cant be sure as i was rushing round on friday at the end of the work. I trimed off about an extra cm all round and its fine now - probably should have double checked it earlier. I'm at a point where i can't go any further anyway as i need to get the leather bits, i have done everything else. None of the fabric shops i've been to in london have any so i'm trawling the charity shops to see if there are any old leather belts i can chop up. Seeing as my ipad has been delayed i have a little bit more time. WOW. I loooove that fabric, and it's perfect with the leather. It looks fantastic! I've confirmed with the publisher that the flap PDF is correctly sized when printed at 100%, and matches the one included in the print version of the book. It should measure 14.5cm across at its widest point. The flap pattern piece measures 14.5cm across at it's widest point, which, when doubled, makes 29cm – this matches the size of the main body piece exactly. The pattern piece includes the seam allowance. Step 2 asks the reader to trim off 1.5cm all around the Decovil interfacing for both the main body and for the flap, and repeated for the fusible fleece. In step 10, where we are making up the case flap, the reader is instructed to trim the seam allowance to 5mm (from 1.5cm to 5mm). Missing out this part of the step would result in the flap piece being 1cm too large all round. Love the pattern, I'm going to try and make it for my sister for Christmas. My questions: as I don't have the book, do you have instructions for making 'open end straps ' (step 4), and 'inserting linings: pull through and turn out method' (step 18)? Hi Aubrey, I don't have those instructions. I think they're probably basic bag-making steps, so you might be able to google for tutorials. If you don't want to purchase the book, you could see if your local library has the book you can borrow, or go look at it in a book store to see those sections. Hi Anonymous, yep, the publisher sent it to me to promote the book. Just FYI - on ease of understanding, I rate these instructions a 5/10. Read through them all. You'll notice that this pattern references other parts of the book. What good is a free tutorial when you have to have the entire book to understand the directions?